May I start by thanking China-Britain Business Council (CBBC) for hosting today's lunch. This is not only a gesture of welcome for me personally but also a reflection of CBBC's long-standing commitment to China-UK relations. Before I came here, I heard that some British friends asked why China should send someone from Pyongyang to serve in London? Apparently, they were keen to know if there were any similarities between Pyongyang and London. On the face of it, there might not seem to be that many similarities. For a start one country is in Asia and the other in Europe. The DPRK has distinct seasons, while I am told in the UK the weather is, well, unique. But only after my arrival, did I discover that both countries like the colour red. In the DPRK needless to say, one sees red wherever one goes. And then I come to London, and red is everywhere! One can see red double-deckers, red telephone booths and red post boxes, which are distinctive symbols of London. Well-known football teams like Arsenal, Manchester United and Liverpool have red logos, so have leading companies such as HSBC, TESCO, and Vodafone. In fact I just came from a meeting with the Lord Speaker only to discover the House of Lords is red, too. Naturally our host today the CBBC also has red in its logo. So you see, red is what unites both countries. And where do I fit in to all this? Well, I needn't tell you how much we prize the colour red back home. For us it means luck and happiness and prosperity. Well, let me come back to China. Premier Wen Jiabao recently made a much publicized comment about the Chinese economy, saying that 2009 has been the most difficult year so far in the new century, and 2010 would be the year when China faces the most complicated economic landscape. Why should the Premier say so? The Chinese economy was hit hard in the beginning of 2009, with export sliding, serious difficulty for many companies and rising employment pressure. The Chinese government responded with a decisive stimulus package, which brought about 8.7% growth, exceeding the 8% target. In 2010, the global economic recovery has so far remained fragile. And in China many companies are still reliant on policy support. The focus this year in China is to strike a proper balance between fast growth, adjusting economic structure and managing inflation. And this is by no means easy. As the financial crisis has shown, the Chinese economy is now very much a part of the global economy. There is understandably greater interest among the outside world in China, and how it relates to other countries in fostering global recovery. Here I would like to briefly address three recent perceptions of China in Western countries. First, the perception that China has become more assertive. I can assure you that there has been no change in China's foreign policy. Promoting peace and development, cultivating cooperation and harmony remains the guiding principle in China's foreign policy. Yet like other countries, China needs to stand up for its principles and core interests. Second, the perception that the investment climate in China is deteriorating. Some may have in mind cases like Google and Rio Tinto. Facts speak louder than words. A recent survey shows that 90% of foreign companies interviewed consider China a top place for their investment. China remained the biggest recipient of FDI among developing countries last year, attracting US$ 90 billion in investment. Opening up remains China's basic state policy and enjoys the support of the Chinese people. China's change and progress in the past 32 years would be unthinkable without opening up. As President Hu Jintao pointed out, suspension or backtracking of reform is not an option. I can also site the example of a British businessman Mr Duncan Clark, who came to Beijing in 1994 to develop e-commerce in China. 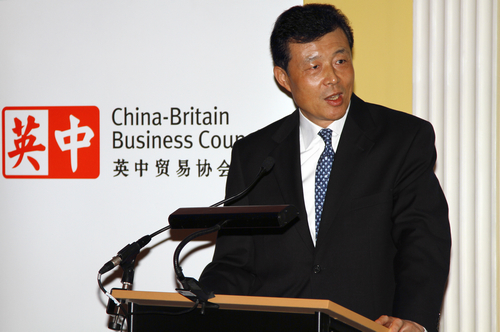 He is now the Vice President of the British Chamber of Commerce in Beijing. "Living in China today," he said, "is like watching a gripping film-it's just too hard to get up and leave half-way." The key is to make the most out of the opportunities that clearly exist in China. Third, the perception that RMB should be revalued. Last weekend in a press conference, Premier Wen gave a clear explanation of this issue. Since July 2005 when reform started, RMB has appreciated by 21% against the US dollar, or 16% in real terms. Between July 2008 and February 2009 when the global economy was in the most difficult phase, the real exchange rate of RMB rose by 14.5%. A basically stable RMB has contributed to the recovery of the global economy. China is a supporter of free trade and has no intention to gain undue advantage through the exchange rate. Let me cite a set of figures. US export to China last year dropped by a mere 0.23% compared with 17% drop overall. According to British figures, British export to China even grew 5.3%. In the first two months of the year, China's import went up 64%, 32 percentage points higher than its export growth. All in all, China will continue to reform the RMB exchange rate regime and keep the RMB exchange rate basically stable at an appropriate level. The above trends in Western opinion of China indicate a deeper challenge of our relationship. We both understand the need to develop a stable and effective partnership between China and the West in an era of globalization. And we both have deep held principles and ideas in dealing with each other. We need to work harder to increase mutual understanding and trust and learn to address differences in a constructive way. Only by doing so can we ensure stable and sound development of our relations. This is true of China's relations with the West in general and with Britain as well. I have come at an interesting time in our relationship. It's an election year in Britain. And China-UK relations have just emerged from recent twists and turns. I must say that our relationship remains fundamentally sound. It has gone way beyond the bilateral level and has taken on greater global and strategic significance. Only last week, during Secretary Miliband's visit to China, the two sides agreed to upgrade the level of our strategic dialogue. This shows the importance both sides place on our relationship and its growing maturity. This has been in the context of growing mutually beneficial cooperation in a wide range of areas such as trade and investment, education, culture, science & technology, and sustainable development. As the new Chinese Ambassador to Britain, my mission is to work with the British side to enhance dialogue, deepen cooperation in key areas and expand mutual understanding and trust. I will always stay on course and work to the best of my efforts. One of the priority areas I would like to talk about is trade and investment ties between our two countries. With a total investment of US$ 16.4 billion, Britain remains the biggest EU investor in China. It has also received more Chinese investment than any other EU country. On the other hand, China-UK trade is still small. Our trade last year accounted for 1.7% of China's total trade and less than 4% of Britain's. There are still barriers in language, information, knowledge and personnel between business communities of the two countries, particularly among the SMEs. British companies are still subject to certain restrictions in high-tech export to China. The key to expanding economic and trade cooperation, in my view, lies in identifying areas where progress can be made and fostering new areas of growth. First, we should seize the opportunity of the Shanghai Expo. More than 190 countries and over 50 international organizations have signed up to the Expo and 70 million Chinese and foreign visitors are expected to come. The British Dandelion Pavilion has caught much attention from the Chinese people. The two sides should work together to turn the Expo into a commercial and cultural highlight of our relationship this year. Second, the two sides should identify priority areas for cooperation. China is focusing on technical innovation of traditional sectors and the development of emerging services. Britain is the world leader in financial services, creative industry and design, and enjoys advanced technology in high-end manufacturing. There is a lot we can do to pool our strengths together. One area that holds out much promise, for example is the low-carbon economy. Britain was the first advocate of low-carbon growth. China is redoubling its efforts in energy efficiency and emission reduction. There is a solid foundation to work from and huge potential to tap. Third, the two sides should work for major success stories that will help lead the way. Given the nature of our economic relations, there have not been many big projects between the two sides. I hope British companies will take an active part in the R&D in China's commercial airplane project and enhance cooperation with Chinese partners in high-speed rail to cite two examples. In all these years, the CBBC has been our reliable partner and I will count on your continued support in the months and years to come. My colleagues and I will also be happy to assist you wherever possible. I look forward to working with you to further our trade and investment relationship and better serve the interests of our two peoples.